Hello, everyone. I hope all is well or, at least, tolerable. I have a few places for you to explore, or to escape into. 1] How many of you get excited by the mere mention of a mind map? I hear ‘mind map’ and my brain says, ‘Ooh!’. I have never stopped to analyse the reaction, but I am aware of it. Flikr has a site that gathers, at last count, 629 different mind maps. I often use mind maps in my early drafts of poems, and in writing down the words from The Sunday Whirl. As I wandered through the pages, I realised that a mind map can become a poem in itself. Even if you don’t mind map, this site has an awesome collection. 2] On the site Write to Done, I read an article, ’20 Strategies For Tackling That “Bottomless Pit” of Writing’ and found much that resonates. My theory in choosing sites for you is that if it resonates in any way with me, it will resonate with many of you, so a bottomless pit it is. Many of you will be familiar with the strategies but, if you are like me, you may have forgotten. I find rereading something like this reminds me there are escape routes. As the author, Ollin Morales, says: Warriors never fear bottomless pits. They welcome them and beat them to the dust. I love the image. 3] The web site, Creative Writing Now, is a place to get lost in. Their mission: a place ‘where you’ll find creative writing courses, ideas, prompts, free online classes, and step-by-step guides to writing fiction, poetry, and drama. CWN was created by writing teachers as a free service to provide a supportive and friendly place for authors and poets at all stages in their writing lives.’ I’m thinking this is particularly useful for beginning writers, but there is much to explore. As with the bottomless pit strategies, repetition never hurts. I rediscover things buried deep under all the new things I learn. 4] April cometh and you know what that means: madness in the form of National Poetry Month. Are you girding your loins? Many of you participate in Robert Lee Brewer’s Poem A Day (known affectionately as PAD), and I have seen other similar things go by. Kelli Agodon sponsors a poetry giveaway. I have participated in that for three years, now. [Hm. Note to self: Procure chapbooks for the giveaway] I will have links for all, closer to April. For now, I have the opening salvo from Poets.org. Check out the poster [right side, top, and the badge for blogs, left side top. That should be enough to be doing. I shall see you tomorrow for the prompt roundup and then, not until Tuesday, March 4, for our next prompt. Hello, everyone. We have a number of announcements, all inviting us to play in some way, and we do like to play, don’t we? I am going to divide the posting into two. The first is one I mentioned last week: The Great Poetry Giveaway. The second will be the rest of the toys. Last April for National Poetry Month many poet bloggers had a big poetry giveaway, where about 50 or so bloggers each gave away 2 books [or more] to their readers. Some bloggers gave away subscriptions to poetry journals. The poet Kelli Agodon is the organizer again this year. For readers who are visiting because they are on the Great Poetry Giveaway trail, welcome. Briefly, I am a writer who thoroughly enjoys keeping a blog because of the wonderful people I meet. The blog has three purposes: on Tuesday I present an exercise which, hopefully, results in a poem; on Thursday I announce whatever the community asks me to announce [like this post]; and on Fridays I give a roundup of the week’s poetry prompt sites. 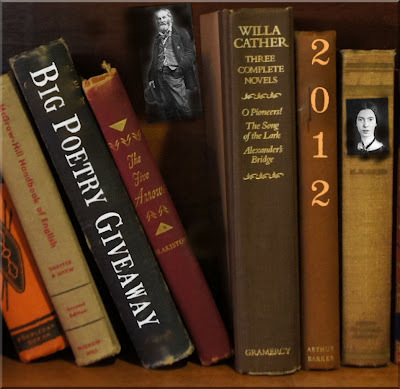 The official start of the Big Poetry Giveaway is now and will last through April 30, 2011. Make sure you enter your email when you leave a comment and note which book you would be interested in winning if you did win [you can leave it up to me, but if you already have one of the books you might want to let me know]. I will pick three winners on May 1st. Two of the chapbooks are brand new and I enjoyed them so much, I want to ship them out to people who may not know of them [or who do and haven’t bought a copy yet]. The third is one I gave away last year and will continue to do so until it stops printing. 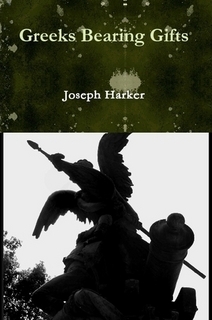 First up is Joseph Harker‘s Greeks Bearing Gifts, ‘exploring different personas from Greek mythology, some of them interpreted in a modern context, or with modern language, or from an unconventional take on the myth’. I keep this book near at hand, both for the enjoyment I receive and for what I learn about writing poetry. This is a young [very young] man to watch. 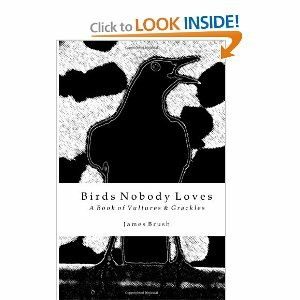 The second book is No Bones to Carry, an award-winning collection by internationally published poet, James Penha, editor of the ezine New Verse News. This is the collection I gave away last year. I chose this book because its author is my friend and mentor. I have read almost all his poetry books [he also publishes fiction in the form of Indonesian folktales] and this is one of my favourites. His poems cannot fail to move you. Three writers whose poems I not only enjoyed reading, but enjoy rereading. Remember: Leave a comment, in this post, saying you would like to win a book and giving me your email, anytime before the end of April, and at the end of the month, I will randomly choose three winners and mail them out the books — no matter where in the world you are. Last year I had a winner in Australia. I shall put reminders in upcoming posts and I shall post links to a list of other participating blogs for you to visit and sign up for their draws, as Kelli posts them. I shall see you all shortly when I publish the second part of today’s announcements. It will be shorter. Truly. A brief post today. How are you all? The weekend nears and so does April, and you know what that means: Screaming. Hair pulling. Possible drinking. Swearing. A poem a day. Thirty poems. 2] One event I participated in last year is the Big Poetry Giveaway, organised by poet and editor Kelli Agodon. About 50 or so bloggers gave away 2 chapbooks each, after a draw among participating readers. You may sign up for as many blogs as you visit. I ended up with five new chapbooks, a lovely way to read poets I didn’t know. Next Thursday, I will post the Great Poetry Giveaway blog where I will tell you the books I will give away and where you can sign up for the draw. You will have a month to sign up. I will also have a link to other participating blogs. The official start of the Big Poetry Giveaway, for my site, will be 29 March, 2012, and will last through April 30, 2012. Coming in April, watch for my special Muse-Sings featured guest, Doug Peters. Doug writes wonderful spiritual and inspirational poetry, and his spoken words set to beautiful music are absolutely exquisite. It will be a definite must-read interview! Also, April is National Poetry Month, celebrated nationally across both Canada and the United States. So get your pens, pencils and typing fingers ready to share your poetry with the world during the entire month. In addition to my regular monthly Medal of Humor week, I’ll be holding a special “Word Whisperer” contest, with a personally signed paperback copy of Love Notes romantic poetry as the prize. As well, at the beginning of the month, I’ll be writing a book review of Part I of Justin Ordonez’ book, Sykosa, as part of the “Novel Publicity” whirlwind blog tour team. Me, here. That’s it for today. I told you it would be short! I shall see you tomorrow for the roundup; Tuesday for an image prompt; and next Thursday for announcements. All kinds of things happening today. I am going to focus on National Poetry Month first and then if that doesn’t take too much space, I shall do my usual roundup. The month really is international in nature because a lot of you from all around the world participate in one of the write a poem a day for thirty days challenges. I will point you towards a couple of choices and a couple of things going on. One of our regular sites, Big Tent Poetry, offers a choice: Some people will be writing a poem-a-day in April in celebration of National Poetry Month, and some people won’t. Whatever you intend to do, we will be right here on our regular Monday-prompt / Friday-poems schedule. If you want to write a poem-a-day using Big Tent prompts, our weekly prompts from March 28 through April 25 will include seven choices. Write to them, one each day, if you like. But if you prefer to ignore all the poem-a-day madness and just want to keep doing what you’re doing, simply pick one from the list and go with it! So if you are going to try a poem a day, head over and look for their prompts for this past week, or start with today’s. Another regular that is offering a month of poems is Writer’s Island. But they are not offering prompts. They are offering a place to post your poems if you wish. They will not offer their usual weekly prompts again, until May. Robert Lee Brewer’s Poetic Asides challenge is well-known and ends with the submission of five poems [if you wish]. I will give you two places to look. The first is the guidelines. And, the second is today’s prompt. For those of you who have dreams, or want to learn how to make dreams a resource for writing, the blog site Inkseeds offers a prompt from an intriguing month of prompts that are based on our personal mythologies. I don’t, as a rule, dream, but I am going to see if I can learn to tap into that. Today’s prompt starts: Whether it was a vivid nightmare or simply the first one you ever told someone else, whatever dream came to mind when you read the question above is probably significant and the one you should use for this exercise. It may contain elements that have since carried over into subsequent or recurring dreams, and possibly offers images that still haunt or amaze you. Now visit the site for what to do with the dream. The last site I want to point you towards for National Poetry month is the Poem in Your Pocket Day, which happens during the month, April 14th. It started as a New York thing but has caught on in a huge way. For information on this and on a Twitter challenge, visit. The Twitter challenge says in part: To celebrate National Poetry Month, the Mayor’s Office is holding its second annual Twitter poetry “Poetweet” contest starting on Friday, April 1. So start scribbling, and tweet us your best rhymes, verses and haikus using #poetweet. Submissions received by April 13 will be considered for publication in Metro on Poem In Your Pocket day (April 14), but Poetweet to your heart’s content throughout the month! The poem in your pocket challenge says: Brought to New York City in 2008 by the Poetry Society of America, participants are given an envelope with a famous first line on the outside, which they use as a starting point to write their own verse. For this year, we are given a chance to participate online and the first lines we have been given are from Emily Dickinson poems. As this has taken more space than I thought, I will offer a prompt from one of our regulars, We Write Poems, so those of you not participating have something to work with this weekend! They ask us to consider fire: Fire is elemental. Fire is a state of change. Write a poem about the art of making fire. Fire means many things. We suggest perhaps you study and consider the actual attributes of fire (maybe do a little internet search). They also provide two interesting sites to watch fire videos for those of us with a little pyro in our souls. And, last, don’t forget this is Poetry Giveaway month, as well, Visit my post here to see what I am giving and for a list of participants, go to Kelli Agodon’s site. The list of participants, where you can throw your hat in for a chance to win a book of poetry, is on the left. Have a wonderful weekend and I shall see you Tuesday for a new exercise. Perhaps we shall start exploring form. And, Thursday come see what words you should be avoiding using, in any writing. Happy writing! And, if you know someone who would enjoy one of these, press one of the buttons below.